I was not a pitcher in college. I was a catcher at a small NCAA Division 1 School, The Citadel — the only military academy ever to make it to a college world series (of course they did it in 1990, 4 years after I graduated, but thats a different story). Actually, I began my collegiate career as a below average shortstop who couldn’t field groundballs. I moved behind the played during the fall of my junior year in college. The first game I ever caught was opening day that year against Clemson. My first two Division 1 at bats came with the bases loaded and 1 out in a tie game and the results of each were exactly the same – a vintage 1-2-3 double play to end the rally. Still, if you search the bowels of the Citadel medial guide, you’ll find my name listed as #5 on the all-time career batting average leader list. .352 for my career! But the numbers don’t really tell the story. I only played 2 seasons at The Citadel, so the stats are a little padded. I spent my freshman and sophomore seasons at Erskine College (NAIA school back then) where I hit .311 and .289 respectively before transferring and sitting out one season as a redshirt. During my junior year at The Citadel, I hit .340, but I had 13 bunt singles, and in my senior year I batted .378, but I only had 3 homers and a just handful of doubles. No one every taught me how to hit. I just got up there and tried to get on base.I swung at just about everything. It was difficult to walk me, but I also rarely struck out and I hardly ever hit a foul ball. I was what they used to call, “a contact hitter.” As I have studied this game over my 25+ years of coaching one thing has become clear. The guys that get all the chicks, the college scholarships, and the pro contracts are the dudes that blast doubles and home runs! My lifelong quest to solve the mystery of power hitting has now come to life at The Florida Baseball Ranch in something called The BATtery Power Hiting System. We call it The BATtery because it’s all about POWER BABY!!!! DOUBLES AND HOMERS!! That’s what gets the scholarships… That’s what gets the pro contracts… And that’s what gets the girls! and its true now…Chicks dig the long ball! And here’s the real truth. Teaching hitting and pitching is really nothing more than teaching human movement. As a physical therapist, I have been studying and teaching human movement for over 23 years. 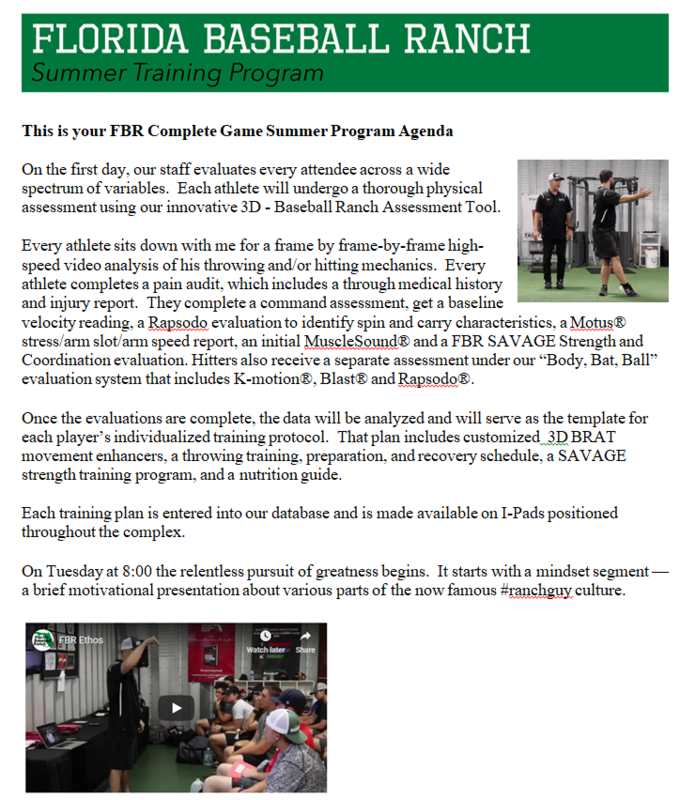 Our understanding of how humans learn movement skills and our ability to implement that knowledge is what sets us apart from most of the other hitting coaches and academies around the country. At the core of the issue is that patterns of movements between individuals are highly variable. That variability makes it very difficult statistically to test your data and your ideas. Because of that variability, to optimize outcomes each individual requires his own customized training plan. The BATtery system is designed specifically to address and indeed to take advantage of the many variations between individuals. Just as we do in the throwing universe, every student who enters our doors will receive a head-to-toe physical assessment and a high speed video analysis. We’ll measure base line bat speed and exit velocity, and we’ll take that information and design a comprehensive, individualized training plan for every athlete. We’ll undergird it all with leading edge motor learning science, and we’ll provide objective feed back and knowledge of results along the way. We’ll also add on our world class power building workout sessions that will develop the beast mode athleticism and physicality it takes to become a prolific power hitter! We’re kicking off The BATtery Hitting System by hosting a 3-hour clinic on Sep 25th presented by my friend Chas Pippit of BaseballRebellion.com. Make this the first step to changing your game. See you at The BATtery!